Going to the see the Kansas City Symphony is one of my favorite pastimes. 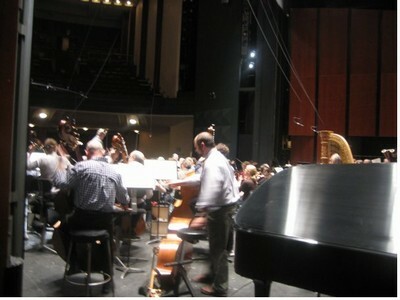 I love seeing "my" musicians, the full orchestra, Michael Stern, but most of all, of course, hearing the music. As addressed in last week's pre-concert talk, there is an energy at a live performance that you just can't get from a recording. This energy is what keeps me coming back enthused. My friends, Karin Lin and Colleen Russo, arrived at my house Saturday afternoon (I had seen Karin on Friday. See a previous blog of mine). Karin brought her two adorable daughters and Colleen, with a recently broken arm, came with her mother. We talked about many things and later Karin and Colleen went shopping with me for a dress for that evening! We had a good time. At about 6:15, we headed over to Kansas City for the pre-concert talk which was to begin at 7:00. The talks, before every symphony concert, are nice because they give substantial background on the program and they involve Michael Stern and the soloist. My question asked about bringing people to classical concerts who don't normally go. I addressed this because Michael Stern had written an article on that subject a week previously. The answer entailed maintaining enthusiasm and persevere in bringing friends to the symphony. As afore mentioned, the concert was remarkable. The Revueltas involved the principle trombonist playing a conch shell! The percussionists were also right on; it was funny because they were all dressed in tuxes going completely tribal. Then came Corigliano's Chaconne, with Joshua Bell soloing. As in most modern music, it initially seemed quirky, but as I got into it, I came to appreciate it more. The real gem, however, arrived in the form of Chausson's Poeme. When I was listening up on it before the concert, it sounded boring (don't smite me), but during the concert, I could appreciate its lyricism and lushness much more than I could via recording. Out of the three Bell played, Poeme is currently my favorite. Saint-Saëns' Introduction and Rondo Capriccioso is always a crowd pleaser and Bell, of course, performed it like a true virtuoso. The way he can toss off those arpeggios is just disgusting. The final piece on the program was Pines of Rome. Because some seats in the second row were open, Colleen and I moved down there at intermission and we got blasted. It was intense, but so much fun at the same time! It was an entertaining weekend! Fear not! This is not public information but we have booked Josh for January 2008. So your wish has already come true. That e-mail, referring to Joshua Bell, was sent to me by the manager of the Kansas City Symphony in January of 2006. Of course I have been anticipating this concert a long time and, so far, I don't see how things can get better! Yesterday was a snow day which made it the perfect opportunity to shadow at the symphony. Since I'm sure I don't want to be an orchestral musician, but I do want to be involved in music, I thought the business side of the symphony would be a good place to scout for potential jobs. I had shadowed previously and many people there know of my scheme to get classical music (via Joshua Bell) on Oprah. Knowing I am a Bell fan, they sent me to his hotel with someone who works at the symphony to pick him up! I was surprised the trusted me with such a task, but it was fun. Just being backstage at the symphony is such a blast. You wouldn't believe how much all the non-musician symphony workers do. Of course, being around a famous violinist was fun too, albeit a bit intimidating. KCS backstage picture from a previous shadowing. Michael Stern (who happens to be Isaac Stern's son) is almost ready to begin rehearsal. Today, Karin Lin flew in from California! Her parents live in Kansas, so she timed her visit to see them with Joshua Bell's concert. Today was special because the symphony was giving an open rehearsal for music students. The principal at my school doesn't like the orchestra going on field trips for some reason, but I felt it was my duty to get my peers to that rehearsal. I was especially adamant because I have been extolling Joshua Bell a lot for the last two years. I came up with a plan my principal couldn't possibly refuse (it involved the middle school, no subs, and "gifted" teachers... I'll leave out the details), and it worked! Needless to say, we all had a lot of fun and Karin and I went backstage afterwards.